Silvia. Silviaaaa. It was the name Nissan gave to its line of sport coupes that were built on its S platform. They were beautiful cars and, in their latter generations, became the go-to drifter’s choice. Here’s a quick walk through of them all. 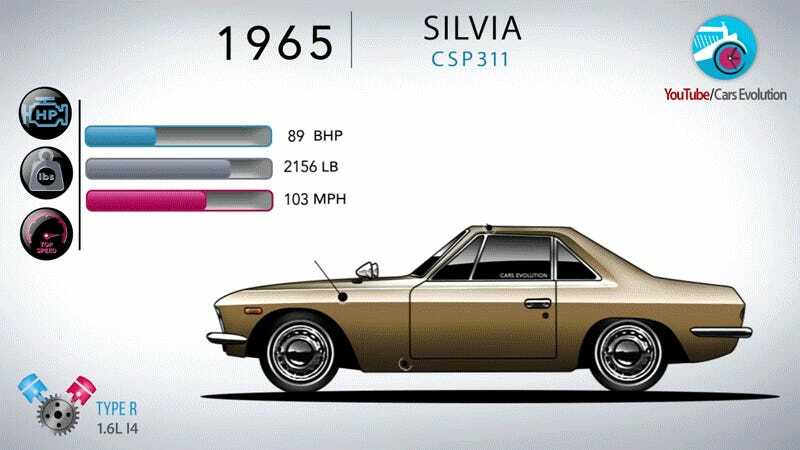 Cars Evolution made an excellent little video recently, which details the Silvia’s timeline from 1965 to 1999, but here are some more details about the cars. The saga begins with the CSP311 chassis. Release for the 1965 model year, there were only 554 ever produced because the body panels were hand-built by Yamaha. That made it very expensive and no two were identical, according to JDM Legends. Then came the S10, to compete with the Toyota Celica. For the U.S. market, it had a 2.0-liter engine; for the Japanese, a 1.8-liter. It was light as hell (about 2,200 lbs) and was probably a true joy to drive. And just look at it! The S110 hatchback followed, seemingly to greet the 1980s with a rad and boxy body style. It was called the Gazelle in Japan and was originally meant to have a rotary engine. Yet, as Japanese Nostalgic Car points out, the rotary was too unreliable and didn’t make it to production. The S110 also gets bonus points for having a Group B rally car version. Naturally aspirated and rear-drive. For the S12, which we in North America know as the 200SX, Nissan offered it with the 2.0-liter motor. However! The S12 RS-X models had turbos, which were accommodated with hood bulges. Nothing better than a functional hood bulge. And the S13, S14 and S15 will be far more familiar to us Americans. The S13 debuted here as the 240SX in both hatchback and coupe form (in Japan, the hatchback was the 180SX). Of course, people then started swapping faces with no pop-up headlights around on the cars. These were called “Sileighty,” which I thought was a completely made-up word until I saw that they were real aftermarket conversions. Happily, the S14 and S15 generations were a lot less complicated. The S14 was only sold as a coupe and remained the 240SX in the United States. It did receive a mid-cycle refresh and got new headlights and stuff like that. You can buy S14 240SXs here, but you’d be hard-pressed to find one that hasn’t been messed with and turned into a drift car. As for the S15? Those were never sold here. Sorry. You’ll have to wait for that pesky 25-year import ban to lift before buying one. Check out the video, it’s neat.